Excitement catapulted from every inch of The Constellation Room as enthusiastic fans waited for the show of the summer to begin. An entertaining concert brimming with quirky dance moves, crowd sing-a-longs, and an overwhelming outburst of love from fan to performer; performer to fan, encapsulated The Vomac Road Trip. 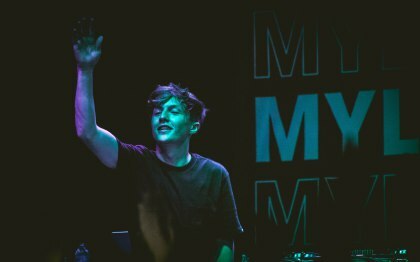 Myles Parrish, a Bay Area native, who recently dove head first into a solo journey after a great run as a duo with longtime friend Kalin White, was now headlining his own tour. With dedicated fans from the Kalin and Myles era, to the new ones joining the family, it’s expected to see a crowd of animated and passionate fans surrounding the vicinity. That elated thrill however, was only a few yards away inside. Dim, intimate, and situated next to a business complex, The Constellation Room was radiating. But it wasn’t just the love for performing and sharing his stories through music that stimulated the excitement: it was the devoted fans. When the house music stopped and the lights dimmed further, the crowd of concertgoers let out a high-pitched, yet joyful shrill. The show was minutes from starting and when it did, the energetic spirit never faltered. Somewhere through the maze of halls were Parrish and his touring family, prepping to begin their night. Talented and playful, opener Jacy took the stage first to share a piece of her soulful touch. Then, the continuation of hysteria was fueled with Jake Parrish, Myles’ brother, a talented producer and DJ. Spinning familiar and upbeat tracks with a unique, innovated Jake spin, the entire room was bouncing off the walls. Immediately right after was Lost Boy, who hyped the crowd with his bouncy and dynamic tunes. 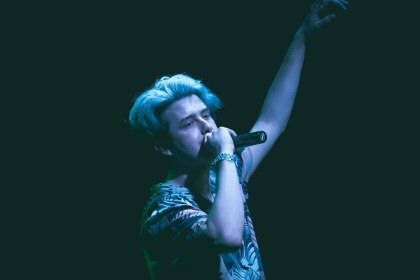 The Vomac Road Trip was a whirlwind of the best summer vibes, and when Myles hit the stage, nothing stopped him from performing with so much heart. The moment he graced the crowd with his infectious dynamism, there was no turning back. 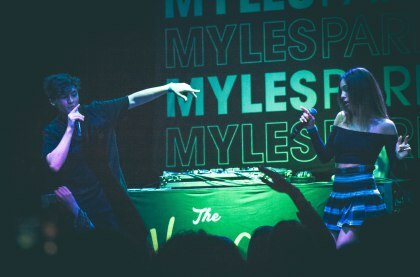 In addition to throwing in a classic Kalin and Myles hit, to eliciting the Bay Area “hyphy movement” within the venue walls, Parrish also performed tracks from his latest album— Vomac anthem ‘Prevost,’ summer kickback-esque ‘Tommy Bahama,’ and cheerful dance track ‘Cut a Rug,’ were just a few to propel the party. To witness the magnetic energy exuded by Parrish during the Santa Ana show, was an insane memory to never be forgotten. His hustle is inspiring, and only greatness will follow him. Despite the storm that life sometimes can be, Parrish has the sunshine and is ready to ride the wave into a successful future. The Vomac Road Trip with Myles Parrish continues through the nation with a Los Angeles show at The Roxy Theater on Sunday, August 6th. Experience the exhilarating celebration – you won’t regret it. Watch Selena Gomez’ Seductive New Video for ‘Fetish’ Pharrell Working on New Albums from Ariana Grande, Justin Timberlake Eight Songs You Should Have Heard This Week Hollywood Has Moved to Coachella for the Weekend. This List of Parties is Proof. Ringo Starr Confirms The Beatles are Bigger than Justin Bieber Taylor Swift Plots Return to Country Roots? Halsey Shares ‘Hopeless Fountain Kingdom’ Album Cover, Announces New Single It’s Not Too Late To Start Doing What You Love!